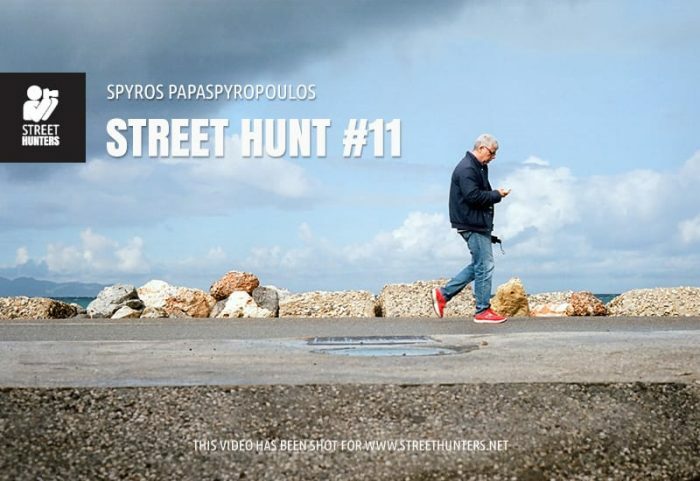 I had been thinking that I have been doing many Street Hunts in the town I live in, Rethymno. I got worried that you guys might have got bored of looking at the same streets all the time, so I decided to jump into the car and drive 80km to Iraklio the largest city of Crete and capital of the island. Iraklio is one of the largest cities in Greece and has a rich history. I will not get into that at the moment, but if you are interested to look it up, just click on this wikipedia link about Iraklio or Heraklion. I went with Digby Fullam a Rethymno based English StreetHunters.net Reader that also helped me film the intro to this video. Thank you for that Digby! This walk is quite interesting because I am using a Camera I haven’t used before on a Street Hunt and also because I find myself experiencing dramatic weather changes throughout the course of the recording. Luckily I was carrying an umbrella, because as you will see there is rain, sun, wind and of course people that I have to tackle with before managing to finish the film and complete the video. But I had a blast! I had to change camera settings nearly before each shot I made, due to the rapid weather changes which made things for me even more complicating. As I always do when filming (or recording would be the right term) a Street Hunt that using a film camera, I share all my 36 shots from the roll. You could say it is something like sharing with you a virtual contact sheet. In this video I find myself sometimes shooting the same subject 2-3 times. The reason for this, as I explain in my video is to make sure I get the camera settings right and thus get a usable picture. The Canonet I am using is extremely silent. If you think that the Yashica Electros I used in Street Hunt #08 and Street Hunt #10 were silent, then you will be blown away by the shutter release of the Canon. It sounds so quiet that sometimes the only thing you can hear is a very subtle “boing” sound, like a spring bouncing. You will see (or hear) what I mean in the video. Besides that “boing” sound you can hear the manual winder cranking in between shots, but that has nothing to do with stealthiness. So, as I mentioned before for this Street Hunt I am using a Canon film camera. Specifically a Canon Canonet QL17 fixed lens rangefinder. The Canonet is small. It is a compact rangefinder about the size of a Sony NEX-6 when equipped with the SEL20F28. About the size of a Fujifilm X100. But even though it is small, it is heavy! It is a hunk of metal. Its build quality is very good and in combination with its weight, it feels very sturdy, however it isn’t a camera that you can carry around for hours and hours in your hand. So I stick it in my pocket when I am not using it. The Canon Canonet QL17 is a shutter priority camera with full manual controls if you wish to do a manual override. If has a shutter speed up to 1/500th of a second and supports up to 800 ASA (ISO) film. It is equipped with a very sharp fixed 40mm f1.7 manual focusing lens! My selection of film is once more the rich in colour Kodak Ektar 100 finest grain negative colour film! It has been “promoted” to my all time favourite negative colour film! This time I shot the film at box speed. One of the StreetHuters.net Readers, Guest Blogger and SHRC Moderator, Edward Conde, has been shooting Ektar at 200 and even 400 and is still getting great results. I will be trying that too in future videos! During this Street Hunt I use the focus ring to manually focus on a subject using the rangefinder, I use pre-focusing, but not zone focusing or hyperfocal distance because the Canon is a shutter priority camera and keeps on changing aperture settings automatically. So any zone focusing would have to be done in Manual mode and I didn’t use Manual mode in this video. If you don’t know what Zone Focusing or Hyperfocal Distance is, you can read our relative post called Learn Zone Focusing and Hyperfocal Distance in Street Photography. One more thing! During the narration I mention our post about backgrounds called “The importance of choosing a background for your shots”, written by guest blogger Mario Mancuso from Italy. Check it out. As always, I have added annotations in the video to make sure that I properly communicate to you what I am trying to convey through my descriptions and actions. Because of the wind, I have also added subtitles at points where my voice can’t be heard clearly. In addition to the video I have made a collection of all the photos I shot. If you want to check out each photo I have uploaded every image I shot in a dedicated Dropbox Album called Street Hunt #11. So, sit back, relax, grab a piece of pizza and a beer or whatever does it for you and enjoy this month’s Iraklio Film Photography Street Hunt! NOTE: If the video doesn’t work in the website directly, please visit the Street Hunters YouTube channel to watch. Announcing Trip to Hamburg sponsored by Cosyspeed for a special Street Hunt recording!